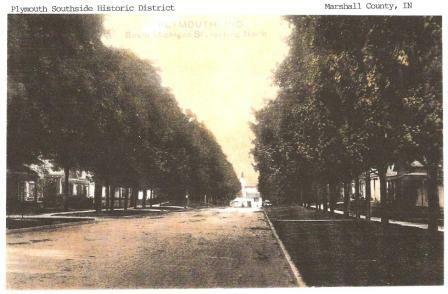 Follow this link that takes you to a blogsite full of information on some of Plymouth's most historic homes: Plymouth Main Street. Many of these homes will be featured in a two-part presentation by Wythougan in February. The blogsite is called Hoosier Happenings and features stories about historic preservation, culture, and other items of interest in the Hoosier state. Stay tuned for more information regarding our programs in February. A few months before the first anniversary of the September 11th attacks Wythougan conceived and funded a simple memorial to commemorate that dark day in American history. The memorial was a simple granite stone positioned between two oak trees. The trees were planted to symbolize the Twin Towers of the World Trade Center; oaks were chosen due to the tree's designation as our National Tree. The memorial was placed on the south side of Jefferson Street, south of the Marshall County Courthouse. When the miniature Statue of Liberty was restored on the courthouse lawn, the granite September 11th memorial stone was relocated to the feet of Lady Liberty. The symbolic oaks are still thriving. While Wythougan always strives to preserve the reminders of our past, there are times when commemorating moments of our recent collective past are important also. September 11th. Marshall County remembers. The 150th anniversary of the original dedication of the Jacoby Church on King Road was held on June 12, 2011. A stirring message was delivered by Bob Read, who grew up in the church, and the Maxinkuckee Singers provided inspirational music. In 1847 a group of German families from Ohio settled together in what would become known as the Jacoby Neighborhood. After losing their daughter Catherine to typhoid fever in 1850, John & Catherine Jacoby deeded a parcel of land for the purpose of a cemetery, church, and school. John Fesser began construction in 1860 on the one room Greek Revival style church building. On May 23, 1861 the Plymouth Democrat reported that the German Reformed Church situated three miles east of Plymouth in the Jacoby neighborhood will be dedicated on June 9, 1861. Jacoby Church operated for the German Reformed and Lutheran Denominations (1850), German Reform Church (1861), St. John’s Church (1870), and St. John’s Reformed Church of Center Township (1892). According to the Daily Pilot on Sunday April 7, 1935 the Maple Grove and Jacoby Sunday School honored John R. Jacoby, Jr. for serving 54 years as a faithful janitor and sexton of the church. During the 1940’s a congregation formed with ties to the Missionary Church denomination, through Bethel College. On June 29, 1958, the Jacoby Church reopened after being closed for many years by the congregation that would later build Sunrise Chapel. 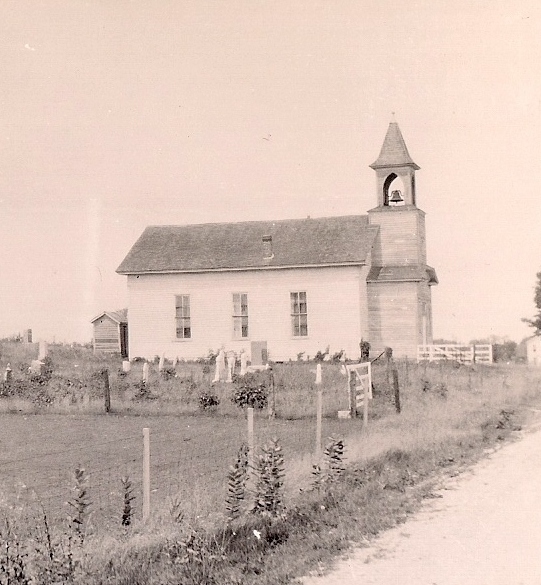 Services were held here until April 26, 1964 when their new church was constructed east of Plymouth. Iris Price, a Jacoby descendant, coordinated maintenance for the structure and cemetery for many years after. A one room school house was once located north of the building. The building is a combination hand-hewn timber frame and balloon frame construction. The floor timbers are oak and poplar logs 24” wide. The roof has unusual hewn timber frame trusses. While most of the interior finishes date to 1910 when the building was remodeled and the foyer and bell tower were added, the unusual wood ceiling was exposed during restoration and dates to 1860. This type of ceiling exists in only one other known location in Indiana. The oil lamps hanging from the walls are original, as are the wood slab benches and wood stoves. The pews, podium, alter, and hymn and attendance boards date to the 1910 remodel as does the piano. In 2006 Wythougan Valley Preservation Council worked with Center Township Trustee Doug Kucera to restore the building. Restoration was completed in 2008 using more than $40,000 in cash and volunteer services. The building was placed on the National Register of Historic Places in 2006. The rededication service is scheduled for Jacoby Church, one mile north of US 30 on King Road, for Sunday, June 12 at 2:00 pm. The event will mark the 150th anniversary of the original dedication on June 9, 1861. The Maxinkuckee Singers will perform and lead in singing hymns. Mr. Robert Read, who attended the building as a child, will provide an inspirational message. Light refreshments will be served. Because parking is at a premium, please consider carpooling with others you may know who would enjoy attending this event. We look forward to marking this important milestone of Marshall County's oldest public building with you. The second phase of bridge construction employed new technology developed at the close of the 19th Century. Concrete cast into arched forms provided a modern approach to traversing the Yellow River. Type: Filled-spandrel two-arch; skewed. In 1987 a cantilevered deck was installed and the project removed rails and lampposts. The original engineer is unknown. The new alignment’s path (1928) of the Lincoln Highway in Indiana was fully decided except for the path it would take through the City of Plymouth. There were two sides lobbying for their own path the highway would take. Ultimately the state told Marshall County if they could not decide, it would be decided for them and a deadline was given. Several meetings followed until the night before the deadline and in packed chambers at the high school, both sides presented their case for their preferred path. The two choices were between the downtown, using Pennsylvania Avenue, or Jefferson Street. The City and downtown businessmen lobbied for the downtown route, while others preferred Jefferson Street. If the Jefferson Street route was chosen, a new bridge would have to be constructed over the Yellow River. If the downtown route was chosen, the highway could use the new Garro Street Bridge. Ultimately the group promoting the use of Jefferson Street won because they were able to show that even with the construction of a new bridge, their path would be less expensive to construct. The new Jefferson Street/Lincoln Highway Bridge was constructed between 1927-1928 for the sole purpose of the new alignment of the Lincoln Highway. The concrete bridge was constructed at the river crossing of one of Plymouth’s most important cross streets. It retains significant integrity despite the loss of its ornate streetlights mounted at each corner. Arched concrete bridges of this period were constructed using wood planks as the underside of the bridge form. The plank and wood grain marks can still be seen in the concrete under the arches. The bridge forms the southern terminus of the Plymouth Downtown Historic District, listed on the National Register of Historic Places in 1998. The bridge was restored in 2007 with handrails sympathetic to the original design with the added feature of lampposts in the style of the historic residential areas of Michigan Street. Daniel Luten was a world-renown concrete bridge engineer and created some of the most spectacular spans in the United States. He taught engineering at Purdue University. The current bridge replaced an early steel truss bridge; the original drawings for the steel bridge are located at the Marshall County Museum. The Marshall County Commissioners restored the bridge in 2007. The bridge was listed on the National Register of Historic Places and is one of only three historic footbridges in the State of Indiana. All three are suspension bridges, meaning that the deck, or walkway, is suspended by cabling to the end piers. 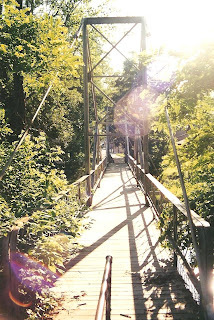 The other two bridges are newer and were part of the New Deal projects in Turkey Run State Park and Winamac. The Rochester Bridge Company operated out of Rochester, Indiana and was a prolific bridge fabrication plant for the Midwest. Type: Pony plate girder truss with two spans on rusticated limestone abutments and center pier. About 1995 the railroad covered the center pier with concrete. When the Pennsylvania Railroad first came through Northern Indiana in 1856 its route through Plymouth crossed the historic Michigan Road with little problem. But as Michigan Street became more traveled it is believed the railroad created an earlier viaduct which then was expanded in about 1900 to accommodate two sets of tracks. Close examination of the stone abutments show various symbols indicating to builders how to construct the abutments, as well as the difference between the earlier stone used for the original abutment and the 1900 construction. In James Cooper’s Historic Metal Bridge Inventory, it states this bridge is among the earliest examples of the Pratt pony span built on Indiana’s rail system that still exists and references the heavy members designed for unusual load-bearing capabilities. As part of the city’s greenway plans a canoe portage will be located below the bridge on the sandy shore of the Yellow River. James Cooper is a professor at Ball State University and is considered the leading authority on Indiana bridges.